The Ralph Foster Museum better known as “The Smithsonian of the Ozarks,” is located on the campus of the College of the Ozarks, a private Christian school. The location of the museum inside the College of the Ozarks help made the Ralph Foster Museum in providing a quality education by focusing on the culture in the Ozarks region. Ralph was a radio mogul in southwest Missouri and founder of KWTO (“Keep Watching The Ozarks”) and the long-running Ozark Jubilee. He has given generous donations of cash and has a great display of artifacts in the museum that earned him gratitude and immortality for himself for as long as the museum stays in business and keeps his name. The museum features one of the best exhibits, a cut-down 1921 Oldsmobile Model 46 Roadster. It’s the truck used in the original Beverly Hillbillies TV series. This unique exhibit was a Bicentennial gift by the show’s producer, Paul Henning, who grew up near the museum. Many of the fans had taken a shot of themselves in the battered front seat, in front of a large picture of Uncle Jed, Jethro, Granny, and Ellie May Clampett, Miss Hathaway and Mr. Drysdale. However, you can only sit in the truck and take your picture, if you pay ten bucks at the cash register. This truck used for the Beverly Hillbillies is a worldly example of what the museum is all about which preserve the memories that relate to the Ozarks, or people in the Ozarks. In the museum, there’s also a display of wood stumps from local trees and a barbed wire collection of a man named Ellis Pentecost. There’s also a restored one-room schoolhouse that merits its own display, a fishing boat. Also on exhibit in the museum is Mrs. Foster’s chair that is made of steer longhorns. Other interesting exhibits that are on display in the museum are some pistols and a rifle owned by Pancho Villa and the revolver that Morgan Earp wore when he was killed while playing pool. For many years, Mr. Foster had been collecting Indian artifacts. His great interest in the School of the Ozarks prompted him to give his vast collection of artifacts to the school’s museum. Because of his abiding interests and generosity, the Board of Trustees of the School of the Ozarks that later became the College of the Ozarks voted to rename the museum “Ralph Foster Museum” in mid-1960s. On August 11, 1984, Ralph Foster passed away. 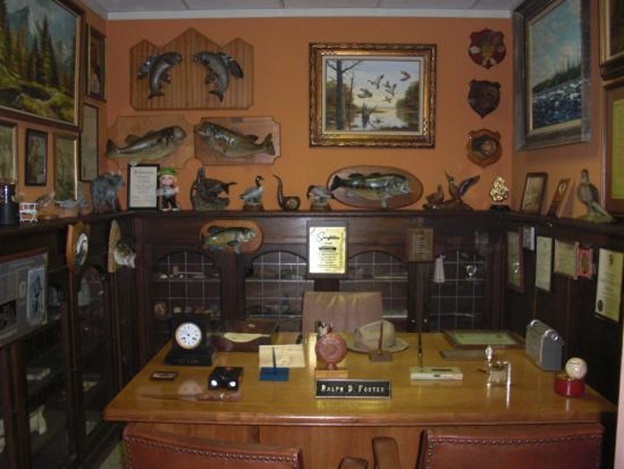 Today, Ralph Foster Museum primarily focuses in collecting, interpreting, preserving, and displaying items relating to the Ozarks region. In addition to famous exhibits, visitors will find antiques, dolls, weapons, natural history and other unique items from around the world. So, if you want to take an educational tour this summer season, visit the Ralph Foster Museum in the College of the Ozarks where you will get to see great exhibits and artifacts from the Ozark region.